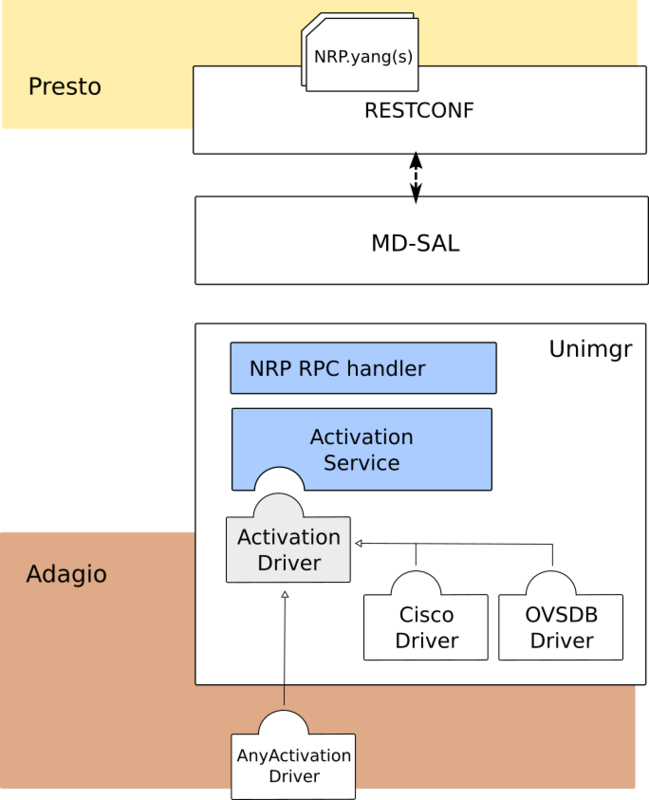 Unimgr provides support for both service orchestration, via the Legato API, and network resource provisioning, via the Presto API. These APIs, and the interfaces they provide, are defined by YANG models developed within MEF in collaboration with ONF and IETF. An application/user can interact with Unimgr at either layer. Presto and Legato APIs are for LSO Architecture reference points defined in MEF 55 specification. In current version of Unimgr the recent version of Presto NRP is supported. This model is based on Transport API (TAPI) from ONF. This API allows for management of connectivity services and exposes abstract topology of the managed infrastracture. By its nature Presto NRP write and update operations are defined as set of RPC calls. All the reads operation can be either specific RPCs or via RESTCONF data tree. Presto layer architecture is depicted in figure above. There are two distinctive parts of Presto NRP business logic Activation Service and Activation Driver. Activation Service part of the framework is to encapsulate the common logic whereas Activation Driver is a way to encapsulate business logic to transform Presto Request into a given underlying technology. This way we are able to handle multi-vendor infrastructures and address various use cases as vendors specific code is encapsulated in drivers. Step 1. Implements only minimal functionality. Step 2. Allows for multi-vendor configuration as decomposition mechanisms defines all drivers required to satisfy given connectivity request. Currently only p2p connectivity services are supported in the decomposition mechanism. Both validation and decomposition mechanisms are plug-able thus users can support more sophisticated scenarios. 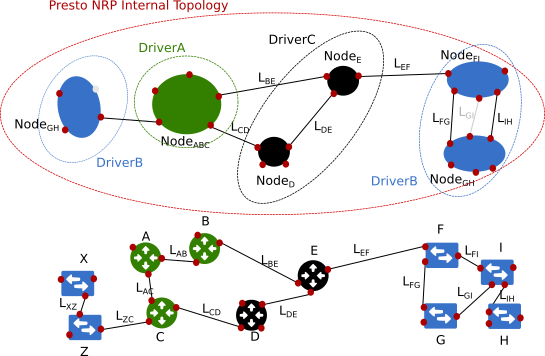 In figure above example topology and drivers are shown. As you can see it is up to driver how to model infrastructure it manages. Thus, driver A has decided to model all devices as single virtual node, whereas driver C is exposing every single device as a node. The connectivity service is defined between ServiceInterfacePoint (SIP) which are mapped to NodeEdgePoint (NEP). A SIP can have UNI, ENNI or INNI role. Assigning a SIP to NEP can be done automatically by driver of with the use of Unimgr extension API. It is assumed that driver can connect eny number of SIPs related to NEPs for every Node it exposes. Which is intended as a template for real drivers development. It is not connected to infrastructure. Which is a driver for OpenFlow infrasturcture. |  |  |  |  |  +--rw (identifier)? |  |  |  |  |  +--rw (endpoint-map-form)? |  |  |     |  +--rw (identifier)?